The TriAdventure Kids In Triathlon (KIT) Triathlon was created to provide an educational platform for youth to have fun staying active. By focusing on swimming, cycling & running, our hope is to introduce participants to activities that offer lifelong healthy opportunities for physical achievement. 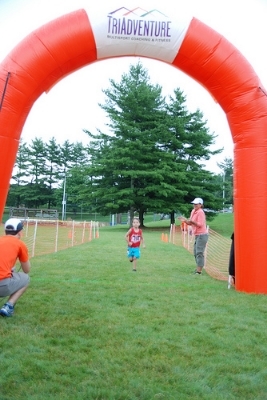 Distances are appropriate for all children to successfully complete the race. This event is open to children ages 4–10, all levels of ability. There will be no refunds for any reason. Participants may defer their entry to another TriAdventure event or to this race in 2020. Deferral deadline is Jul 3rd, 2019. Thank you for understanding. Check-In and In-person registration will take place on Saturday at the Blacksburg Aquatic Center from 4–6pm. 4–5 year old 25 yard swim, 6–8 year old 50 yard swim, 9–10 year old 100 yard swim. Participants start from either the A End of the Pool (4–5 year olds start first), or the B end of the pool (6–8 year olds, then 9–10 year olds). 9–10 year olds will snake swim using two lanes. 7–8 year olds will snake swim using one lane. 4–6 year olds will have one half lane per person and will swim their desired distance in that half lane only. All participants will exit the swim from the B end of the pool and proceed to the transition area (TA). Volunteers will help the participants exit the pool. All participants will exit the pool via the front door (C), run along the flags and into the transition area. As they reach the transition area, chalk boxes will be drawn along the TA on the right, with bike racks on the left. The bicycles will be stationed either in the chalk boxes. The youngest triathletes 4–5 will find their bikes on the right in the chalk boxes, while the 6-8 year olds will find their bikes on the left. The 9–10 year olds will find their bikes in the middle. Each age-group transition area will be clearly marked. Volunteers will help the participants find their bikes and exit the transition area. 4–5 year olds 1 lap (~.5 mile bike), 6–8 year olds 2 laps (~1 mile bike), 9–10 year olds 3 laps (~1.5 mile bike) – Exact distances yet to be determined. All participants will exit the TA on the upper end (E) nearest the BAC parking lot for the bike. Exits and Entrances will be clearly marked. The bike course goes right, through the BAC parking lot, right to the service road towards the tennis courts, right at the tennis court parking lot, around the parking lot in a rectangle, right onto the service road back towards the BAC, left into the BAC parking lot and straight through to the Rec Center parking lot, left in front of the Rec Center and around the parking lot to either the transition area (4–5 year olds) or right, through the BAC parking lot again for an additional lap (6–8 year olds) or laps (9–10 year olds). Returning back to the transition area, participants will return their bikes to their original spot, according to age-group. Volunteers will help the participants park their bikes and exit the transition area. 4–5 = 1 lap (~.25 mile), 6–8 = 2 laps (~.5 mile), 9–10 = 2.5 to 3 laps (~1 mile). All participants will exit the transition area on the lower end (F) of the TA for the run. After exiting the transition area, participants will follow the flags to the rec fields and then around the rec fields, taking a counter clockwise direction around the field. After circling the field, participants will go straight to the finish, or right to begin an additional, or additional laps. No parking is allowed in the Blacksburg Rec Center, Aquatic Center or Tennis Court lots. Please park across the street from the Aquatic Center. You may park near the track, or in the old high school parking lot. There will be signs. Each finisher will receive a finisher medal and a prize (all gifts are donated by local businesses) chosen from a prize table. Event photos will be available on the TriAdventure Facebook Page approximately one-month after the race. Post race meal will be provided for the racers. From 460 Bypass, take the Tom's Creek exit. If coming from the West, turn left at the end of the ramp. If coming from the East, turn right at the end of the ramp. Turn left at the first light. Go through two more lights. You will cross Main Street. A 7-11 will be on your right. Go down the hill and up the hill and the Aquatic Center will be on your right. Turn left on Grove Avenue to access the parking areas. If you are coming from Harding Avenue onto Patrick Henry you will take a right on Grove Avenue.